Enjoy 2% interest per year on the first S$36,000 deposited in your child’s CDA and 0.05% per year thereafter. Save on learning courses, kindergartens, party catering and more. Open the account with your child to join the OCBC Mighty Savers® Programme. Deposit S$50 monthly with no withdrawals to enjoy 0.8% p.a. The CDA is designed to give your child a head start in life by matching your savings dollar-for-dollar. With the OCBC CDA, you can get higher interests and extra benefits too. Save any time until your child turns 12 – right up to December 31 of that year. Your savings are matched dollar-for-dollar, up to the cap set by the Government. 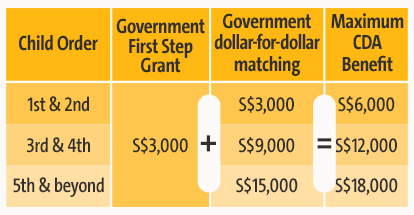 If your child is born from 24 March 2016, you will receive an upfront CDA First Step Grant of S$3,000, paid into your child’s OCBC CDA upon account opening. This is in addition to the dollar-for-dollar matching of savings in your child’s CDA, up to a cap. When your child turns 13, the unspent balance goes to their Post Secondary Education Account (PSEA), making it easier to pay education fees. We know you will have your hands full after your child is born. That is why you may now do a pre-birth registration as early as 8 weeks before the estimated delivery date of your child at Baby Bonus Online. Your child will automatically join the Baby Bonus Scheme upon birth registration, and his OCBC CDA will be opened within 3-5 working days. Visit Baby Bonus Online to perform pre-birth registration today. Remember to select OCBC CDA! Visit Baby Bonus Online and choose OCBC Child Development Account. Note: Please accept the CDA Terms & Conditions within Baby Bonus Online for successful account opening. Insurance policies will be underwritten by The Great Eastern Life Assurance Company or The Overseas Assurance Corporation Limited, each a wholly-owned subsidiary of Great Eastern Holdings Limited and a member of the OCBC Group, and are not bank deposits or obligations of, or guaranteed by OCBC Bank. Max is a registered trademark of The Overseas Assurance Corporation Limited. Buying a life insurance policy is a long-term commitment. An early termination of the policy usually involves high costs and the surrender value payable may be less than the total premiums paid. It is usually detrimental to replace an existing accident and health policy with a new one. A penalty may be imposed for early policy termination and the new policy may cost more or have less benefits at the same cost. If you decide that the policy is not suitable after purchasing it, you may terminate the policy in accordance with the free look provision, if any, and the insurer may recover from you any expense incurred by the insurer in underwriting the policy. From 1 August 2015 onwards. Terms and conditions apply. The promotion of 40% discount is only valid when you purchase the adult plan plus child plan plus child rider altogether, and is applicable to the first 12 months of your ShieldWise plan only. ShieldWise is underwritten by The Overseas Assurance Corporation Limited, a wholly-owned subsidiary of Great Eastern Holdings Limited and a member of the OCBC Group, and is not a deposit or obligation of, or guaranteed by OCBC Bank. You may wish to seek advice from a financial adviser before making a commitment to purchase an insurance policy. In the event that you choose not to seek advice from a financial adviser, you should consider whether the insurance policy in question is suitable for you. This material is for general information only. It is not a contract of insurance. It does not constitute an offer to buy an insurance product or service. It is also not intended to provide any insurance or financial advice. The specific terms and conditions of the plan are set out in the policy documents. A person interested in the insurance policies should read the product summary and benefit illustration (available from OCBC Bank) before deciding whether to buy this product. This policy is subject to the Payment Before Cover Warranty Clause which requires the payment to be paid and received on or before the inception date of the policy and endorsement. It is usually detrimental to replace an existing accident and health plan with a new one. A penalty may be imposed for early plan termination and the new plan may cost more or have less benefits at the same cost. No representation or warranty whatsoever in respect of any information provided herein is given by OCBC Bank and it should not be relied upon as such. OCBC Bank does not undertake an obligation to update the information or to correct any inaccuracy that may become apparent at a later time. All information presented is subject to change without notice. OCBC Bank shall not be responsible or liable for any loss or damage whatsoever arising directly or indirectly howsoever in connection with or as a result of any person acting on any information provided herein. The insurance plans are protected under the Policy Owners' Protection Scheme which is administered by the Singapore Deposit Insurance Corporation (SDIC). Coverage for your policy is automatic and no further action is required from you. For more information on the types of benefits that are covered under the scheme as well as the limits of coverage, where applicable, please contact us or visit the Life Insurance Association (LIA) or General Insurance Association (GIA) or SDIC websites (www.lia.org.sg or www.gia.org.sg or www.sdic.org.sg). The promotion of 40% discount is only valid when you purchase the adult plan plus child plan plus child rider altogether, and is applicable to the first 12 months of your PA Protect plan only. PA Protect is underwritten by The Overseas Assurance Corporation Limited, a wholly-owned subsidiary of Great Eastern Holdings Limited and a member of the OCBC Group, and is not a deposit or obligation of, or guaranteed by OCBC Bank. You may wish to seek advice from a financial adviser before making a commitment to purchase an insurance policy. In the event that you choose not to seek advice from a financial adviser, you should consider whether the insurance policy in question is suitable for you. This material is for general information only. It is not a contract of insurance. It does not constitute an offer to buy an insurance product or service. It is also not intended to provide any insurance or financial advice. The specific terms and conditions of the plan are set out in the policy documents. A person interested in the insurance policies should read the product summary and benefit illustration (available from OCBC Bank) before deciding whether to buy this product. This policy is subject to the Payment Before Cover Warranty Clause which requires the payment to be paid and received on or before the inception date of the policy and endorsement. It is usually detrimental to replace an existing accident and health plan with a new one. A penalty may be imposed for early plan termination and the new plan may cost more or have less benefits at the same cost. No representation or warranty whatsoever in respect of any information provided herein is given by OCBC Bank and it should not be relied upon as such. OCBC Bank does not undertake an obligation to update the information or to correct any inaccuracy that may become apparent at a later time. All information presented is subject to change without notice. OCBC Bank shall not be responsible or liable for any loss or damage whatsoever arising directly or indirectly howsoever in connection with or as a result of any person acting on any information provided herein. If you decide that the policy is not suitable after purchasing it, you may terminate the policy in accordance with the free look provision, if any, and the insurer may recover from you any expense incurred by the insurer in underwriting the policy. This document is for general information only. It is not a contract of insurance or an offer to buy an insurance product or service. It is also not meant to provide any insurance or financial advice. The specific terms and conditions of the plan are set out in the policy documents. If you are interested in the insurance policies, you should read the product summary and benefit illustration (available from us) before deciding whether to buy this product. This document does not take into account your particular investment and protection aims, financial situation or needs. Please ask a financial adviser for advice about whether the insurance product is suitable for you before you commit to buying the product. If you choose not to get advice from a financial adviser, you should consider whether the product is suitable for you. Buying health insurance products that are not suitable for you may impact your ability to finance your future healthcare needs. If you decide that the policy is not suitable after purchasing it, you may terminate the policy in accordance with the free look provision, if any, and the insurer may recover from you any expense incurred by the insurer in underwriting the policy. It is usually detrimental to replace an existing accident and health plan with a new one. A penalty may be imposed for early plan termination and the new plan may cost more or have less benefits at the same cost. Insurance policies are underwritten by The Great Eastern Life Assurance Company Limited, or Great Eastern General Insurance Limited, both wholly-owned subsidiaries of Great Eastern Holdings Limited and members of the OCBC Group. Insurance policies are not bank deposits or obligations of, or guaranteed by OCBC Bank. We do not guarantee that any of the information provided in this document is accurate and you should not rely on it as such. We do not guarantee to update the information or to correct any inaccuracies. All information may change without notice. We will not be liable for any loss or damage arising directly or indirectly in connection with or as a result of you acting on the information in this document. The insurance plans are protected under the Policy Owners' Protection Scheme which is administered by the Singapore Deposit Insurance Corporation (SDIC). Coverage for your policy is automatic and no further action is required from you. For more information on the types of benefits that are covered under the scheme as well as the limits of coverage, where applicable, please contact us or visit the Life Insurance Association (LIA) or SDIC websites (www.lia.org.sg or www.sdic.org.sg). A maximum of three children can be covered under your PA Protect plan. PA Protect is underwritten by Great Eastern General Insurance Limited, a wholly-owned subsidiary of Great Eastern Holdings Limited and a member of the OCBC Group, and is not a deposit or obligation of, or guaranteed by OCBC Bank. You may wish to seek advice from a financial adviser before making a commitment to purchase an insurance policy. In the event that you choose not to seek advice from a financial adviser, you should consider whether the insurance policy in question is suitable for you. In the event that you decide the policy is not suitable after purchasing the policy, you may terminate the policy in accordance with the free-look provision, if any, and the insurer may recover from you any expense incurred by the insurer in underwriting the policy. This material is for general information only. It is not a contract of insurance. It does not constitute an offer to buy an insurance product or service. It is also not intended to provide any insurance or financial advice. The specific terms and conditions of the plan are set out in the policy documents. This policy is subject to the Payment Before Cover Warranty Clause which requires the payment to be paid and received on or before the inception date of the policy and endorsement. This plan is protected under the Policy Owners' Protection Scheme which is administered by the Singapore Deposit Insurance Corporation (SDIC). Coverage for your policy is automatic and no further action is required from you. For more information on the types of benefits that are covered under the scheme as well as the limits of coverage, where applicable, please contact us or visit the General Insurance Association (GIA) or SDIC websites (www.gia.org.sg or www.sdic.org.sg).